As some of you know, I love to ride my bike and recently, I've particularly enjoyed riding my new cyclocross bike. A cyclocross bike is a modified road bike frame with cantilever mud-clearing brakes and knobby tires. It allows you to ride off-road comfortably and on the road efficiently and quickly. Plus, it’s so close to a road bike in fit, it doesn’t play with your positioning! Anyway, on a recent early morning ride in the Marshall Mesa open space, I was struck by the wild sunflowers lining the dirt road. Sunflowers always grab my attention with their bright yellow petals and their unabashed cheeriness. They put a smile on my face no matter my mood. On this day, I was enthralled again by the way the sunflowers seem to naturally angle themselves eastward toward the rising sun. It’s as if they anticipate its rising and get ready to position themselves so that they can best view it and absorb its warmth and light. I found myself humming, “Joyful, Joyful, We Adore Thee,” especially that line, “Hearts unfold like flowers before thee, opening to the sun above.” Those sunflowers made me think of our lives—do we orient ourselves towards God’s warmth and light? The sunflowers do so naturally; they simply do what they’re made for. They seem to want to be in the best position possible to absorb all they can from the sun. There’s a lesson there for us. If we’ve been made to know and love God, if we are uniquely created in God’s image, if our “hearts are restless ‘til they rest in God” (St. Augustine), wouldn’t we want to be angled toward God as well? And yet there seems to be much evidence that we don’t want this. Or at least act like we do. Much of the time, we live life uprooted: we settle for artificial light and indoor potting soil. Instead of unfolding boldly in God’s presence, we shrink from God’s brightness, wrap our petals around ourselves, coil inward…and wither. Made to be like sunflowers, we too often live like pressed flowers, having once known fresh brightness, we now live life compressed, hedged in by stress and busyness and distraction. 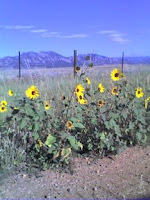 What would it take, I wonder, for us to emulate the sunflowers on Marshall open space? Would it begin in trust—genuinely believing that opening ourselves fully and freely to God would bring deep joy? Would it demand a soil change—uprooting from some things or behaviors or relationships which drain us of true life? Would it require intentionality—positioning ourselves before God in a regular way, so as to be bathed in his light? Recall the wise words of Jesus: “Consider the [flowers] of the field, how they grow…” (Matthew 6:28). How are you growing these days? Do you see why I love riding my bike? There's a scene in the movie "Wedding Crashers" (not that I ever watched it... ;-) that has Owen Wilson's character and Vince Vaughn's character debate the Scripture to be read at a wedding they've just crashed: "Twenty bucks says it's 1Corinthians 13." To which, the other replies: "Naah, Colossians 3." I had to laugh. When my wife and I selected Colossians 3:12-17 for our wedding lo these many years ago, we felt we were doing something novel and deeply personal. We had no idea that we were selecting one of the most common texts read in weddings. Now, as a pastor, I just chuckle to myself when I recommend it to young couples (and base my homily to them on it). The text is a good one: basically, Paul commends the Christians to whom he writes to put on, as if articles of clothing, the virtues and character of Christ. Many believe Paul is crafting a homily of his own, a baptismal sermon meant to remind Christians of their baptisms, in which they commemorated their dying and rising with Christ (spiritually) with their emulation of his behavior (actually). History tells us that early Christians stripped off their old clothing before entering the baptismal pool and were clothed with a pure white garment, symbolizing their new life in Christ, upon their emergence from the water. Paul wants his flock to recall this act (and the faith which inspired it) as an inspiration for them to renounce their old way of life and identify with Christ's new way of living. They are to "put on" or clothe themselves with virtues of compassion, kindness, humility, meekness, and patience, in addition to other behaviors (see verses 12-17). The issue I've wrestled with over the years has to do with the "put-on" nature of this teaching: is Paul guilty of encouraging spiritual pretense or religious hypocrisy? Is this a glorified "fake it 'til you make it" coaching? Are Jesus' followers supposed to act in ways that are not true to their usual behavior (assuming they struggled with the same bad habits, temptations, self-centeredness, addictions, etc, that we do?)?! No. Not if we accept Paul's radical premise: believers in Christ, through a decisive act of faith, imaged in baptism, have lived into the Bible's story: they've acknowledged their utter helplessness under the rule of sin. They've accepted the verdict of God's just judgment; they've embraced God's gracious, surprise provision of his only Son as a substitute to take our punishment on the cross. And they've trusted in Christ's resurrection from the dead as a sign of reconciliation to God and an assurance of the reality of their new (and eventually eternal) life. When this occurs for human beings, they are made new at their core. God implants in their hearts a fresh, new humanity that must begin to express itself actually in changed behavior. So, is this instruction in Colossians 3 a grand put on? Not at all. It's personal trainer Paul's prescribed workout for expressing a health on the outside which has already been implanted by God's grace on the inside. What Paul (and more importantly, God) seeks is an increasing congruence between the heart and the epidermis: that the new life of Christ made real on the inside by faith, conversion, and baptism is increasingly lived out on the outside--in changed behavior. At issue is our ongoing faith: do we genuinely believe we're new--and will we choose to live like it?